In Part 1 of this series, we featured five outstanding visual artists that have managed to combine their commitment to animal rights and their art in unique ways. In this installment, we feature a diverse group that ranges from a world-famous artist that defined the graphic art of an entire generation to modern illustrators, installation artists and a cartoonist that are shaping the future of the visual art medium. The single common thread that all these artists share is a passion for animal rights that not only impacts their personal lives, but also in many cases, has a direct influence on the art they create. 1. Peter Max Legendary artist, Peter Max grew up living alongside a Buddhist monastery in Shanghai. He became a vegan in his twenties while living in Paris, and subsequently got involved in animal rights activism. 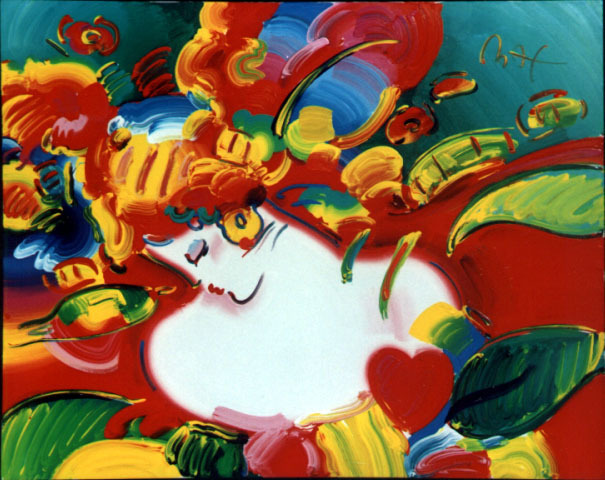 In 2002, Peter Max famously fought to rescue Cindy Woo, a cow that escaped a slaughterhouse near Cincinnati by leaping over a six-foot fence. After fighting for days to get the local authorities to release the cow, he finally succeeded and had the cow transported to Farm Sanctuary in Watkins Glen, N.Y., where she got to live out the rest of her life in peace. 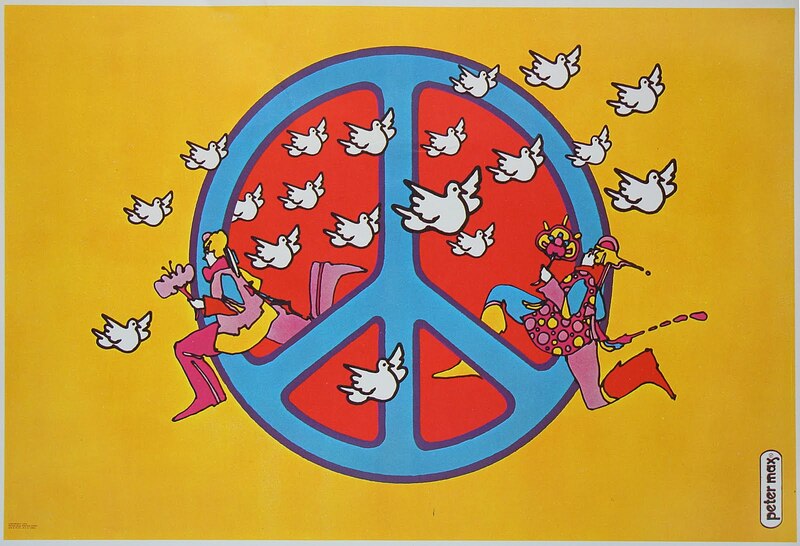 As an artist, Peter Max’s iconic psychedelic ’60s style art, with its distinctive line work and bold color combinations is perhaps the most well known images of the 60’s hippy-flower-power generation. 2. Kurt Halsey Hugely popular artist, vegan and animal rights activist based in Portland, Kurt Halsey‘s art examines (in his words) “the little moments and simple thoughts, and I’m not sure they need to mean anything more than that”. His art is simplistic, yet has an emotional quality to it that makes it very unique — he uses images of big-headed teenage lovers and sad animals in soft, pale colors. His installations have a similar quality to them; Philadelphia is one such beautiful example which features a dead bird (in the form of a cute stuffed toy) in a cage with hand drawn sheet music of Louis Armstrong’s “What A Wonderful World”. 3. Dan Piraro Award winning cartoonist Dan Piraro is widely known as the creator of the Bizarro comic strip, which has been in syndication since 1985. Piraro is a committed animal advocate and vegan and his Bizarro comic strip often incorporates themes related to veganism and animal rights. He has also dedicated an entire section on the Bizarroo website, where he touches upon why he is a vegan, features his animal rights-related cartoons and videos and hosts an online store offering posters, t-shirts, postcards, etc featuring his artwork. Piraro donates all profits from this store towards animal rights causes. 4. Zoe Birrell Back in 2006, vegan Portuguese artist Zoe Birrell received worldwide attention while she was an art student at Glasgow University for creating an art installation consisting of a herd of 400+ dairy cows that equaled her body weight in vegan fair-trade chocolate. The inspiration for Zoe’s installation was the lives of modern dairy cows that are kept perpetually pregnant and thus full of hormones, while suffering the emotional stress of losing their baby calves. Her work was intended to explore the connections between these farmed animals and human femininity along with issues like the impact of consumer habits on the planet. 5. Angela Singer British born and New Zealand-based artist and animal rights activist Angela Singer is known for artwork that features discarded vintage taxidermy that is recycled to highlight unnecessary use and exploitation of animals by humans. Her work is controversial and has a macabre quality to it, but does a very good job of using art to highlight the human tendency to believe we are separate and superior to other species on this planet. Much of her recent work is focused on challenging the nobility of hunting for trophy, by emphasizing the wounds of hunted animals with objects like dripping beads and porcelain flowers. I love the comics by Dan Piraro. His animals rights and political themed ones are always funny and thought provoking, and it’s great that he’s featured in mainstream media where his message is visible to a wider audience!